Owning a property on the French Riviera is a fabulous investment, but it can also be a lot of work. So we provide an exclusive real estate management service for luxury properties in the South of France. We’ll take care of running your French residence on a day to day basis so you don’t need to. Let our team act as a PA for your property, they’ll handle it all from organising cleaning to security, maintenance to gardening and everything in-between. With years of experience in property management on the French Riviera and an extensive network of professional contacts, we’ll ensure that your home is perfectly looked after, all year round. Barbara Gray is Head of our Property Management team in Cannes and she’s been working in the luxury Real Estate industry for over 7 years. Thanks to her background in prestige event management and sales, Barbara is highly experienced and can organise just about anything for anybody, anywhere in the South of France. With extensive knowledge of the French Riviera and incredible connections, when it comes to looking after your luxury property, Barbara and her team are definitely the best people for the job. We’ve been handling luxury real estate on the French Riviera for years and we know your time is valuable. We also know that no two properties are the same so we offer a complete range of flexible tailor-made property management services to fit your lifestyle. From dealing with a plumbing emergency to having the pool cleaned, our dedicated Property Management team are available 7 days a week and can arrange almost anything for you at a moment's notice. 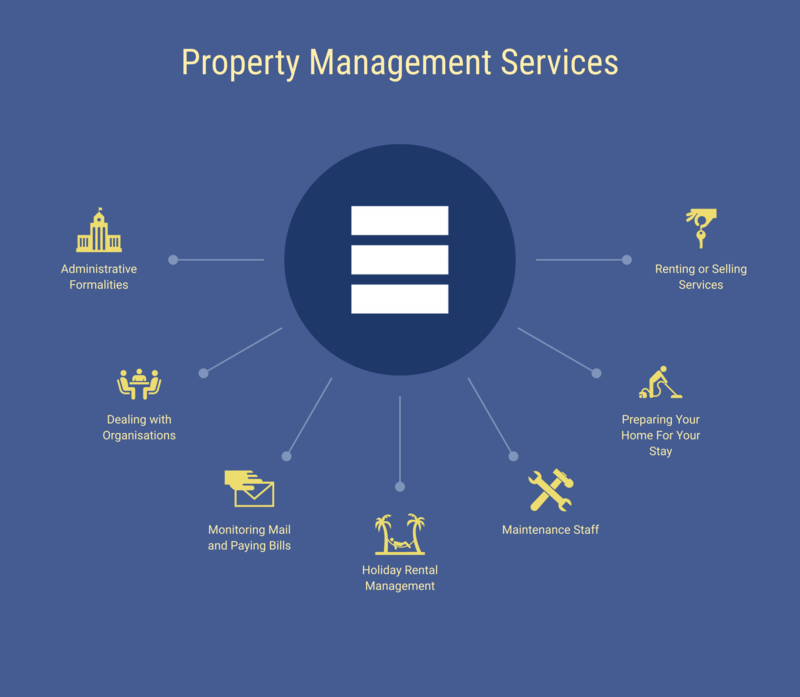 To keep things simple, our property management contract includes a fixed fee which covers the basic maintenance of your property on an annual basis. Any other services you might request in addition to your contract will then be invoiced to you on a regular basis. Owning a luxury property in France often involves a lot of red tape. To save you time and hassle, our team will handle any administrative formalities related to your French Riviera villa or apartment. There’s nothing more frustrating than spending hours on the phone trying to get through to someone who can help you. Which is why we’ll be delighted to recommend top-notch professionals who can deal with the town hall, tax office and utility companies for you. Let someone else do all the hard work so you don’t have to. Make sure that you don’t miss any important correspondence or the payment deadline for your monthly invoice while you’re out of town. We’ll monitor your mail and pay your bills for you so you’ll always be up to date with your paperwork. Whether you need a housekeeper, gardener, pool man, interior decorator, or all of the above, we can hire a contractor to provide all the services you require on a year-round basis. Alternatively, we can also help you to recruit discreet and reliable staff to take care of your property. Whichever option you prefer, rest assured we'll liaise with all staff members while you’re out of town so there’ll no need to worry about who’s taking care of your home. From household maintenance to redecorating the bathroom, we’ll coordinate everything with your contractors to make sure you’re perfectly happy with the end result. There’s nothing like coming back home. To make sure you receive a warm welcome when you arrive in the French Riviera, we’ll have your house all ready and waiting for you, just the way you like it. We can fill the bedrooms with your favourite fresh flowers, pop a selection of delicious French cheeses in the fridge, or have a chilled bottle of champagne on ice to celebrate your homecoming, the choice is entirely up to you. We don’t just deal with Property Management. We also have a fantastic Rental Department available should you decide to let your property as a vacation rental. Forget the stress of dealing with key handovers and cleaning, our Rental Department team will care of all the details and oversee the rental process from A-Z, so you’ll have complete peace of mind that your home is being well looked after. On top of that, we have a dedicated marketing team who are in charge of generating more bookings for your property. And should you decide to sell your French Riviera real estate, our experienced Sales Team will be happy to have your house valued, handle visits from potential buyers and make sure your property always looks its best with regular maintenance. Whatever your plans for the future, we’ll be with you every step of the way to make sure that you and your home are in good hands. If you’d like more information about our high-end personalised property management services, please get in touch with our team. We’ll be delighted to take care of your French Riviera property on your behalf. We can also meet you at your property anywhere on the French Riviera.